WELCOME to the second week of The PINcentive Blog Hop! I am extremely excited to provide this link up for you today and the opportunity for you to increase your traffic, followers, and improve your page rank! With that said, I look forward to partying with you on a weekly basis! Each week, 3 winners will be chosen by our cohosts. 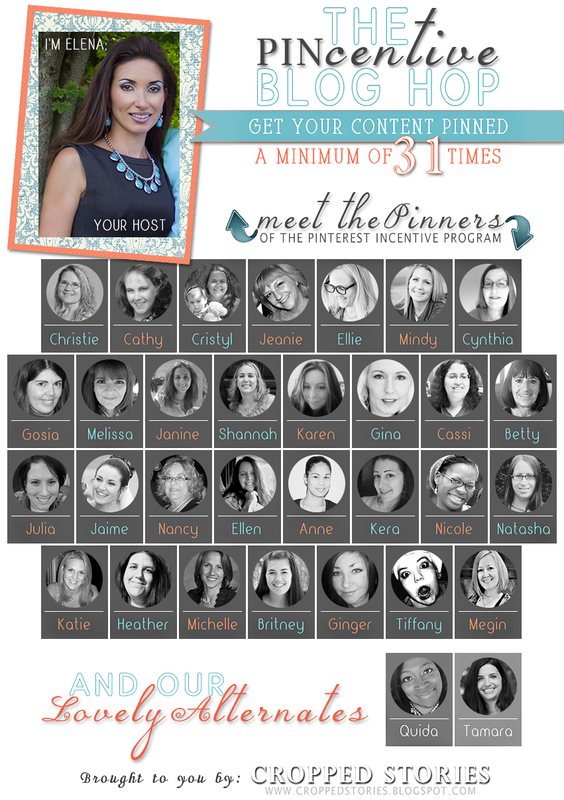 As a winner, you will be featured and, your content will be pinned a minimum of 31 times by my Pinterest Incentive Program (PIP) team members below. Additionally your content will be pinned by the following week’s blog hop participants! 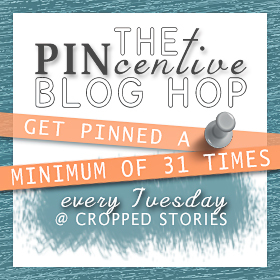 That’s right; blog hop participants will be required to pin the winner’s content. The number of link ups we have will determine the total number of times your content gets pinned so, PLEASE FEEL FREE TO SPREAD THE WORD! It will only benefit you in the long run! Also, as a winner, you’ll have the opportunity to co-host our next Blog Hop and choose our winners! Blog hop code will be provided to all Co-hosts on Sunday evening. This will give everyone ample time to draft their post and, if necessary, troubleshoot any problems that may arise. 1. Follow the Host and Co-hosts (above) via a minimum of one method they’ve chosen to include above. A smaller size can be found on my PINcentive Blog Hop page. 4. Pin the winner’s content from the week before. 5. Link up anything and everything with the exception of giveaways and other link ups. Posts must be family friendly and published in the past week. Sorry folks, but only 1 post per blog hop participant, please. 6. Link up using your post url (NOT the url address of your main page). 7. Most importantly, HAVE FUN, mingle, make some new friends, pin to your heart’s desire, and leave some comment love! Do not use the customized Pin It button that appears when you hover over a participant’s thumbnail image. Using it will ONLY pin the thumbnail image (linking you back to my website) and not that person’s post. To pin correctly, please click on the link below the thumbnail image and pin directly from their page. I reserve the right to remove any links that don’t meet these requirements. Parenting is complex. Our intuition, our personality, our child’s unique temperament, our family wisdom, and, honestly, sheer accident and trial-and-error all play a role. But there is also a growing body of research and reflective writing that provides parents with data and insight to inform our choices and philosophies. Enter The Brilliant Book Club! The Brilliant Book Club is a collaborative project among five bloggers: Lauren Apfel of Omnimom, Deb CG of Urban Moo Cow , Sarah Rudell Beach of Left Brain Buddha, Jessica Smock of School of Smock (me!) and Stephanie Sprenger of Mommy, For Real. We all love reading non-fiction. Though as parents we are busy, we still want to read thought-provoking books and share our considerations with one another. The Brilliant Book Club is for parents who want to read the latest books about parenting — from research-based books on parenting practice to books that reflect on the emotional and personal aspects of childrearing. Every other month, we will select a recent book about parenting. Over eight weeks, we will invite you to read along with us, and share your ideas with us on Facebook, Twitter and our blogs. On the last Monday of each month, each of us will share posts of our thoughts about the current selection and our own unique perspective on it as parents. We encourage you to read, reflect and share with us as we illuminate research and insights that can help us all shine. Our first book pick is Hilary Levey Friedman’s Playing to Win: Raising Children in a Competitive Culture . Why do American children participate in so many adult-run activities outside of the home, especially when family time is so scarce? By analyzing the roots of these competitive afterschool activities and their contemporary effects, Playing to Win contextualizes elementary school-age children’s activities, and suggests they have become proving grounds for success in the tournament of life—especially when it comes to coveted admission to elite universities, and beyond. In offering a behind-the-scenes look at how “Tiger Moms” evolve, Playing to Win introduces concepts like competitive kid capital, the carving up of honor, and pink warrior girls. Perfect for those interested in childhood and family, education, gender, and inequality, Playing to Win details the structures shaping American children’s lives as they learn how to play to win. And here is an August 6, 2013 post in The Atlantic adapted from the book: “Soccer Isn’t for Girly-Girls? How Parents Pick the Sports Their Daughters Play” to whet your appetite. Our first post on the book will be on Monday, September 20, 2013. We encourage you to read the book and join the dialogue on our Facebook page, on Twitter with the hashtag #BrilliantBooks and on our blogs. Be sure to follow us all on your social media channel(s) of choice to keep up with the latest! Follow The Brilliant Book Club on Facebook! What do you think of the new endeavor? Are there new books that you’re excited about reading? Aww, shucks. Will be interested in your usual brilliant thoughts as well! Wonderful! Can’t wait to read the books and you thoughts and insights! Looking forward to participating! My son is 4, and I constantly vacillate between wondering if he should be in some sort of extracurricular sport or if a full day of Pre-K is plenty for his age. Great Idea! I can’t wait to learn more and hopefully I’ll have the chance to read along with you on some of these picks. I hope you will link up with us at the #MTMmixer again so we don’t forget to check in and catch your reviews! Have a wonderful week! Isn’t this just the greatest hop! I followed you on Google+, Pinterest and Twitter. for the first few challenges you learn the basics of driving.